Project Runway has made its mark on the fashion industry by producing some extraordinary designers, including season 5 winner Leanne Marshall. 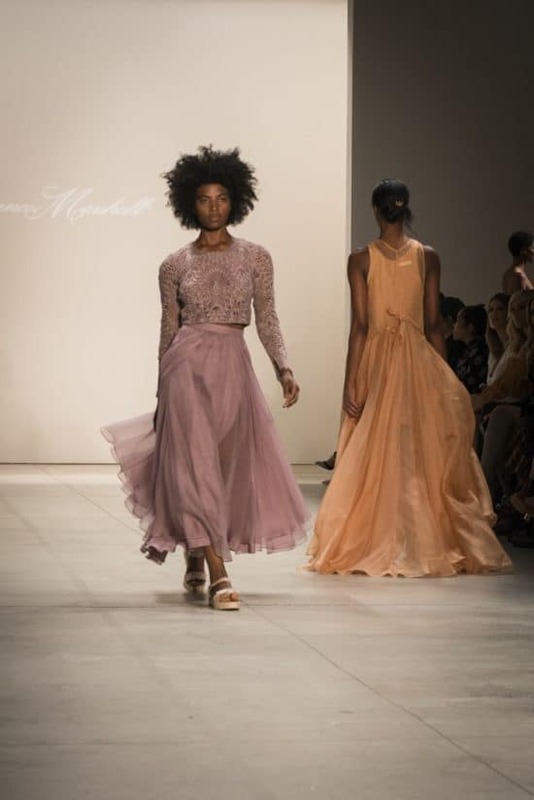 Fashion Mingle was thrilled to be invited to see the Leanne Marshall NYFW collection. Fashion Week is nothing new for Marshall, who has presented regularly since her reality TV win in 2008. Needless to say, I was excited to see what she had in store for us with her Spring / Summer 2017 collection! 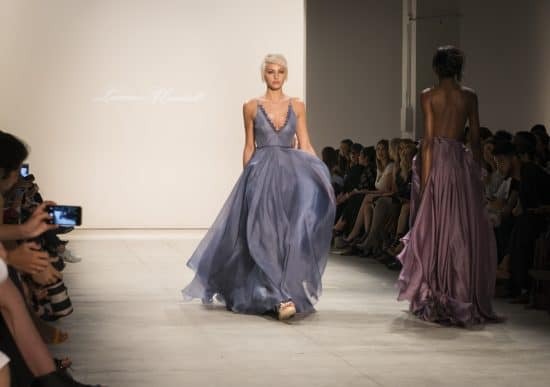 The Leanne Marshall NYFW collection was highly anticipated, as she is no stranger to the lime light of the fashion industry. She has been featured in many major publications, such as the New York Times, People, Elle, National Geographic. Marshall has shown collections at New York Fashion Week and other fashion weeks across the globe. For the Spring / Summer 2017 Leanne Marshall NYFW collection, smoke began to pour from the entrance of the runway as the first model appeared. 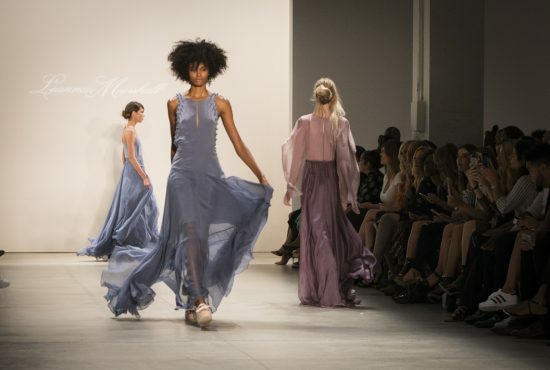 Adorned in brilliant pale blues, the first stage of the Leanne Marshall NYFW collection was etherial and breathtaking. 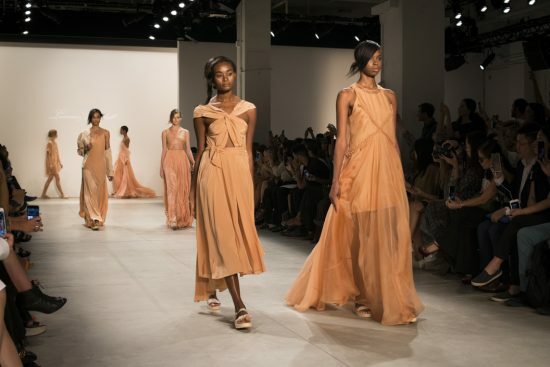 Gowns ranged from flowing to form fitting, and in shades of pastel and darker orange. As the show went on, the color pallet transitioned once again to gowns of pale purple and deeper blues. A continuing trend of lace and sheer fabrics accented the collection. What started off as ready to wear quickly moved into couture gowns that would be a statement piece for any occasion. Leanne Marshall took to the runway with the model wearing her final piece, and the applause were thunderous. All in all I have to say that Leanne’s collection was breath taking. 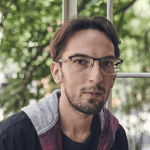 The color pallet gave a nod to the fall season, however the designs kept true to the more breathable and comfortable trends of the spring and summer months. Leanne Marshall continues to impress long after her Project Runway win, and I can’t wait to see what this innovative designer will showcase in the future.